We’ve prepped our Mitsubishi Montero to handle journeys of a several hundred miles or so. It’s interesting to see how people who travel tens of thousands of miles prep theirs. 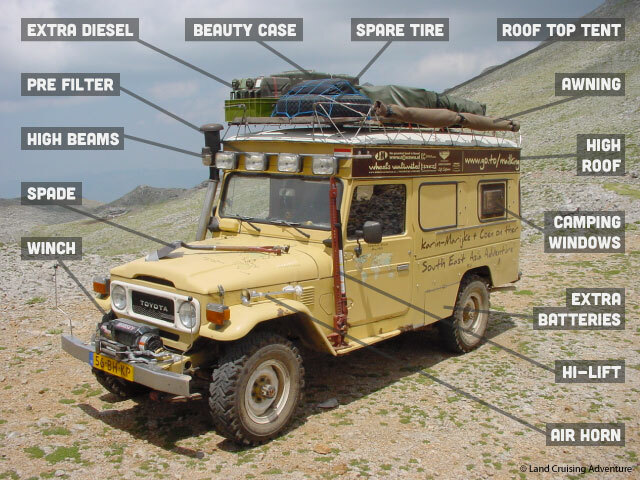 The couple behind the site Land Cruising Adventure have a page devoted to the modifications on their Land Cruiser BJ45. It makes for informed reading. It’s a phenomenal juxtaposition of how the rigs that not only talk the talk but drive the drive are so spartanly equipped vs the usual high-budget rolling billboards of the weekend overlander. The Land Cruiser Adventure couple’s set up is a poignant reminder that there’s no need to delay an adventure by getting overly hung up the lack of expensive equipment. Tally ho!